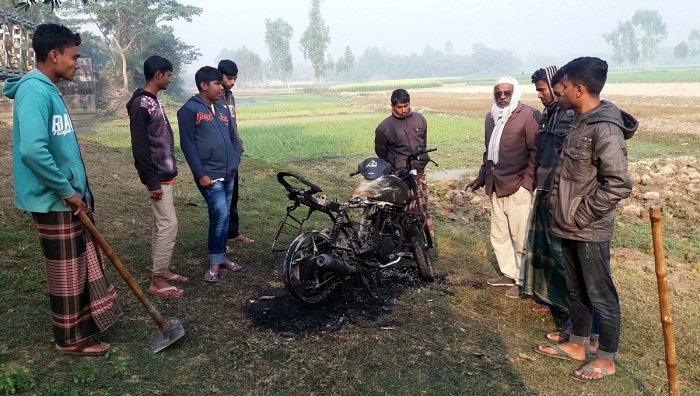 The motorcycle of a local Swechchhasebak Dal leader was torched allegedly by Awami League activists at Gonapara in Joypurhat Sadar upazila on Thursday night. Sajgar Hossain, general secretary Bambu union unit of Swechchhasebak Dal in Khetlala upazila, made the allegation on Friday. Sajgar alleged that a group of Awami League men, including Faruk Hossain, Tariqul and Mabud Hossain, riding on motorcycles came to Battali area on Thursday evening to catch him. Sensing trouble, he speed away riding on his own motorbike towards Sotahar in Sadar upazila and the ruling party men chased him. At one stage, he ditched the bike and fled. The AL activists took the motorcycle under the Gonapara Bailey Bridge and set it on fire by pouring petrol on it, according to locals. Md Mominul Haque, officer-in-charge of Sadar Police Station, said they were unaware of such incident. He, however, said action will be taken if they receive any written complaint. Sajgar Hossain is accused in a case on charge of setting fire to an Awami League election camp in the upazila on December 24 and his wife is also accused in a case filed over a clash between AL-BNP men at Battali Bazar on December 30. However, he secured bail from the High Court in the case.